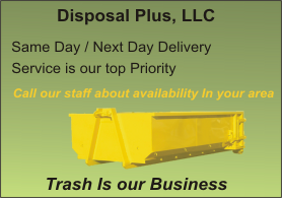 Disposal Plus is committed to providing quality roll off dumpster service to meet the specific needs of its commercial customers both large and small. Call us and let us earn your business! Avoid costly downtime waiting for dumpster pick up and delivery. One invoice, one dedicated service contact. A true business partner - We deliver for you, so you can focus on growing your business! Tailored proposals to match your specific project roll-off dumpster needs. Service quality unparalleled in the waste management industry. Reliability of a family owned company that takes pride in delivering on promises.